Getting your content marketing analysis right isn't just about finding out how successful your strategy is and validating it to stakeholders. It's the only way you'll be able to make your content marketing strategy better and use it for achieving business goals. Without the right metrics, you are making decisions in the dark, possibly without even realizing it. Only by knowing clearly where your content marketing is furthering your organization's business goals, and where it is falling short or is misaligned, will you ever be able to turn your content into the powerhouse that drives business growth. Something you know it is capable of. Your metrics are what will tell the story of your content, illustrating where it works, how well, and why or why not. It is content marketing metrics that define the impact your strategy is making on business growth. Only by using the right metrics, however, can you distinguish between the potential of your content and what it is currently doing to move your organization closer to its goals. Which means, there is a big problem if you are using the wrong metrics, whether you're putting too much value on vanity metrics or are simply off on your key performance indicators. If this is the case, your content marketing reporting could be misleading your strategy, taking it in the wrong direction, spreading it too thin, or preventing it from reaching its potential as a tool for growth because you're missing opportunities. How do most content marketers measure up? If you're having trouble measuring the worth of your content marketing, you're not alone. 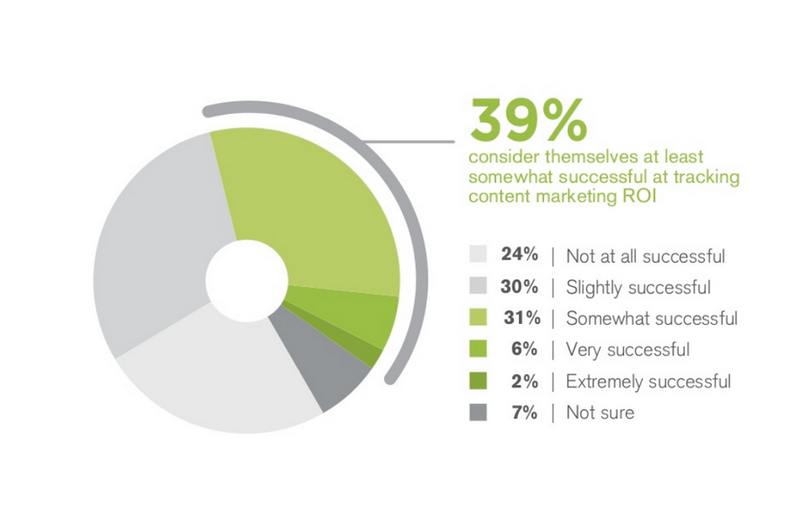 Only 39 percent of marketers believe they are at least somewhat successful at tracking ROI. Just 8 percent say they are very successful. And, 65 percent of B2B marketers are struggling to define what content is effective and what isn't. This leaves a lot of room for improvement. It also indicates that gaining a huge competitive edge may lie in your ability to track and measure your content. The bottom line is, most content marketers aren't getting their marketing metrics right, despite all the marketing technology available today. 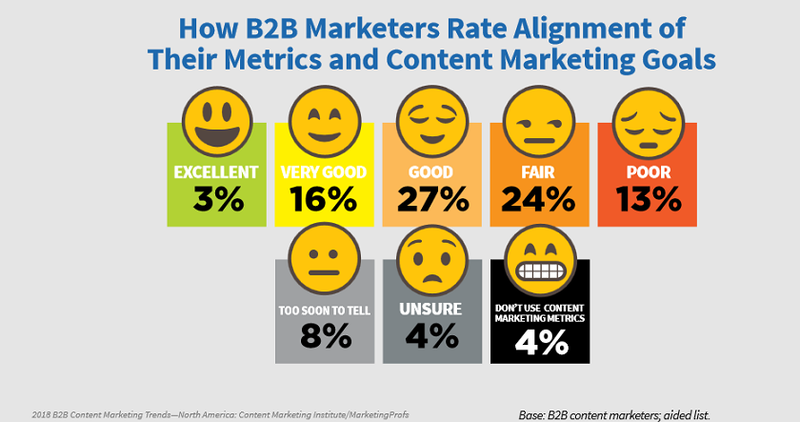 Less than half of B2B marketers – about 46 percent – are satisfied that their marketing metrics are aligned with their content marketing goals. More often than not, marketers are simply not tracking the right metrics. How can you make your analytics align with your goals and support a goal-focused content marketing strategy? First, it goes back to establishing your KPIs – and really digging deep to determine which ones matter, right now, for your organization. A lot of marketers just use general marketing metrics but fail to interpret the most essential for your business. "It makes no difference whatsoever what MY most important content marketing metric is – the real question is: what metric, what key performance indicator is most important to your business? No two marketers' objectives are exactly alike. What matters is aligning against business goals, not all the abstract things you can measure." And second, it's about using the right marketing analytics solutions and making your platforms work for you. This means you'll need to develop a marketing technology stack that allows you to clearly track the entire buyer journey, starting from the first touch point to closing a sale. What are the top goals of your content marketing strategy? Is the focus on attracting new customers to help fuel future business growth, so your priorities may be lead generation and customer acquisition? Is the objective to build trust in your brand and establish your organization as an industry thought leader? In this case, your content marketing metrics may revolve around social media engagement, market education and website traffic. If your strategy's main goal is to encourage sales and drive revenue growth, the focus may be on lead nurturing or customer retention. Most marketing teams have multiple objectives but identifying which matter the most – right now – is critical to creating a results-driven content marketing strategy. Of course, every business wants to generate leads, build brand awareness and increase revenue. However, there has to be a focused priority to form the backbone of your content marketing. This is what you base your KPIs on. With a clear idea of your current content marketing goals, you'll know which metrics matter the most right now. For example, consumption and lead metrics will take a front row seat on your analytics platforms when your primary goal is to attract new customers. You'll still use KPIs from different categories as you'll need to understand how effective your content is at each stage of the buyer journey, but it is the priority metrics that show you if you are reaching your main goals. This distinction is also important for communicating with management or other stakeholders the impact of your content. If your designated objective is brand awareness and your metrics show your content strategy has created a vibrant brand following, but sales metrics have modestly inched forward, you can still demonstrate that your content marketing is working. It achieved its goals. And, of course, with that vibrant brand advocate army your content strategy helped to form, watch out sales numbers, you're next! It's easier to reassure stakeholders when the primary objectives are laid out and the related metrics take center stage. Then, you can move onto your next content marketing priorities with the confidence of C-suite. Consumption metrics have to do with the number of people consuming your content, as well as the frequency and depth of their consumption and what channels they are using to reach your content. These metrics are going to take a front row seat in your content marketing reporting if your priority goals are building brand awareness, lead generation and lead nurturing. As the cost of acquiring a new customer is seven times that of retaining an old one, and your current customers will spend 31 percent more on average than new ones, this is one area of content marketing analytics you don't want to overlook. Even when you're goal-focused on lead generation, sales or other common priorities, don't take your eye off of your current customers or you could be losing ground where it matters most, even when you are generating a lot of interest and action from new prospects. Customer retention KPIs will give you an idea of how successful your content is at keeping your current audience engaged and motivated. This is where you can get a good idea of how useful and relevant your content is. People will share because your content has value to them and they believe it will offer value to someone else. Social media metrics, like shares and likes, are your main sharing metrics, as well as email forwards. Your audience will engage because the content is interesting, provocative, or enjoyable. Engagement is a good litmus test for your brand's likability. Both sharing and engagement metrics are critical when establishing your organization as a thought-leader is on your goal short list. Page depth, blog and social comments and session duration are good engagement metrics. Sharing and engagement analysis is where your content's KPIs are going to vary widely depending on the unique characteristics of your brand and the specific marketing channels you use. "The one metric I really look at is comments per post. It tells me how engaged my audience is. No matter how much traffic you have, if you can't cultivate an engaged audience, you won't be able to convert those visitors into customers." For brands that focus on in-person marketing events, engagement may gear more towards event metrics like registration numbers and participation metrics during and after the event. For blog heavy content marketing, you may want to include reader feedback, such as fanmail, social reach outs, and positive chatter. 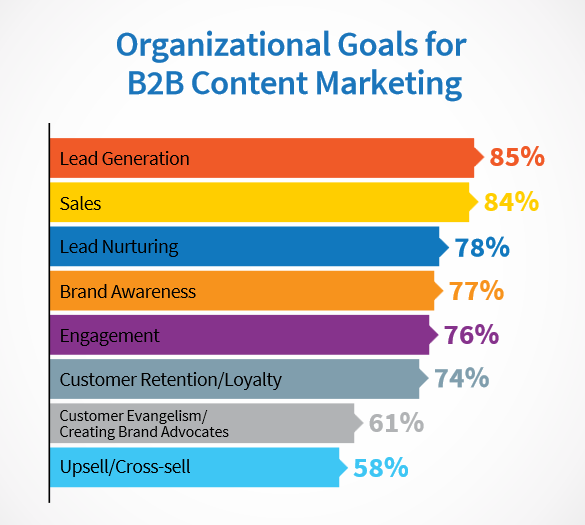 Lead generation is traditionally one of the top goals for B2B content marketers. This is the meat and potatoes of the buying process. Along with lead nurturing, it's the middle-of-the-funnel where people go from just-a-consumer to your consumer. Lead metrics include the number of new leads generated and the number who interact with a specific piece of content. Your funnel conversion rate will show which pieces of your content are the most effective. If you are honing in on lead generation, it's also useful to include time to conversion and per channel conversion rates. "Leads are the metric that, as marketers, we have to rely on. Because leads mean money." And the grand finale of all your marketing efforts – sales. These metrics look at how content impacts the bottom of your sales funnel. When your number one content marketing goal is to drive sales, these are the numbers that will be the most important. And how to harness the insights from your chosen metrics? Organize your marketing technology tools so you are getting all the analytics you need to gauge the performance of your content marketing strategy, without getting lost in a sea of numbers. How you set up your marketing technology stack will depend on the needs of your organization, what types of content you are using and, of course, which marketing metrics are most aligned with organizational goals. For your martech stack structure, you may be using different platforms for different pieces of content. Google Analytics for website consumption, retention and engagement metrics. 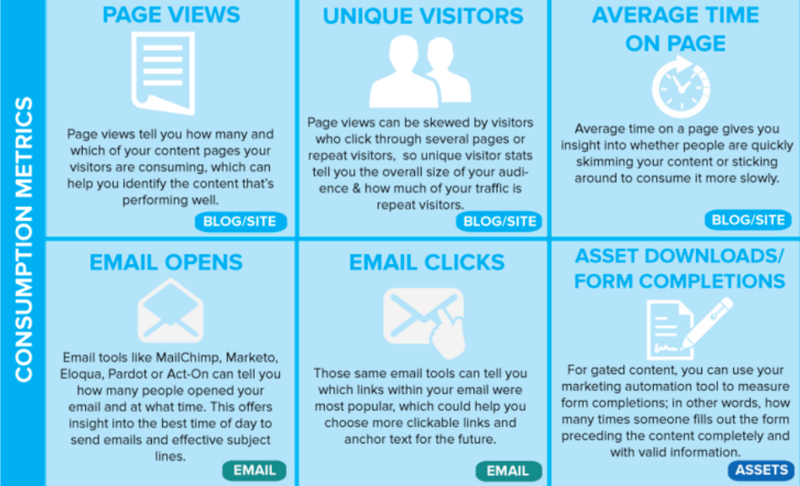 Dedicated email marketing platforms like MailChimp or Campaign Monitor are used for all your email metrics, such as your click-through rates, open rates and subscribers and opt-outs. FeedBurner can give you a clear viewpoint on your marketing feeds. Social media tools like Hootsuite, Bitly, Disqus, SharedCount, and Buffer, as well as just looking at the social site metrics, offer consumption, sharing, engagement and retention metrics. With a marketing automation platform like Marketo and Hubspot, you can keep track of your contents' lead metrics and set up dynamic processes for measuring your campaigns. A CRM like Salesforce can be used to set up in-depth sales analytics. Infusionsoft, Salesforce's Pardot and Zoho CRM are all hybrid marketing automation and CRM platforms for organizations that want to keep their marketing and sales reporting in one place. How many marketing tools are enough for solid content marketing analysis? Business size, how dynamic your content marketing is and your budget will factor into how many platforms you use. Many of today's digital marketing solutions overlap, for example, MailChimp may have built its reputation as an email marketing service, but it is also one of the best marketing automation platforms for small to medium-sized businesses. On the other hand, with a multi-layered marketing technology stack, it's easier to focus on a certain type of metric or touch point. Your team may be able to gain more insight and be able to compartmentalize the data surrounding critical stages. What are other marketing teams using? As of 2015, 51 percent of organizations were using at least 21 digital marketing solutions. The key to making your marketing technology stack work efficiently is communication. Data should be shared with sales, customer service and other departments, as well as internally within your marketing team. This is where regular, short meetings can be helpful for sharing data and making sure everyone is on the same page with what the numbers are saying. A smart approach to your content marketing metrics will help you stay focused on desired outcomes. For pulling off a successful strategy, this focus is paramount. It's easy to get caught up in the pressure to pull off the latest content trends, especially when they are as flashy and talked about as augmented reality, VR, 360-degree video, and virtual assistants. All of which may or may not help you achieve your objectives. Likewise, it is just as tempting to get caught in the trap of habit. A lot of marketers stick with a particular content schedule because it has worked for years. This safe approach can stifle your campaigns, stopping your content from growing and evolving with the world around it – both in terms of shirting consumer expectations and changing content marketing best practices. By taking an analytics-driven approach, you can seek opportunities, experiment, and refine your strategy based on how your pieces of content are impacting your designated marketing metrics. This allows you to always tailor your content marketing strategy around organizational goals. Which will make your content more useful to your organization. Isn't that the whole objective? To make sure you are spending your analytics efforts tracking the 'right' numbers, one of the best things you can do if you're having trouble is to scale back. 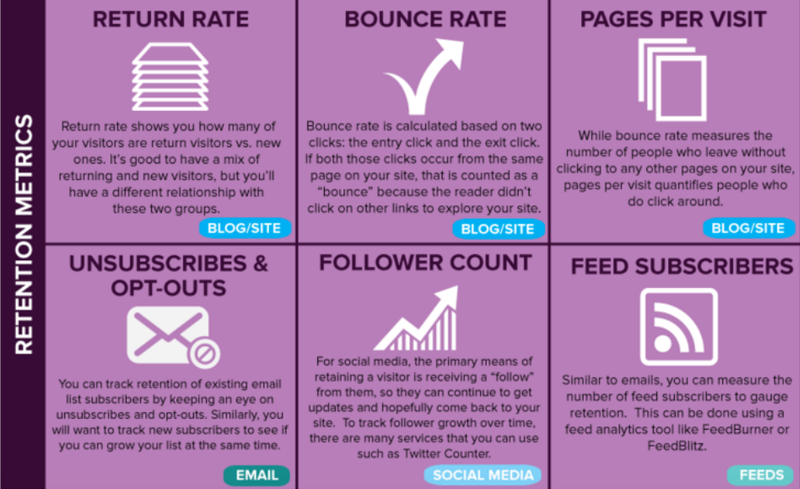 Trying to make sense out of 29 or 30 content marketing metrics, with different KPIs being tied to various touch points and objectives, is going to leave you with a lot of attractive marketing reporting that doesn't offer the clear answers you need. Start with fewer metrics, such as the core metrics for your marketing team as well as a small number that laser focus on your one or two top content goals. This allows you to use your metrics to better improve your content. Then, expand from there once you master a small number of metrics. When you can see right away the impact a piece of content is having or how a certain type of content is directly affecting your bottom line, you can then go back and continually refine your content strategy. Smarter metrics means smarter content marketing decisions – and better outcomes.